The Ohio Department of Transportation and the Lake County Engineer’s Office have partnered together on the Vrooman Road Bridge Project, involving the construction of a new high-level bridge on a new alignment over the Grand River, along with the resurfacing of the existing Vrooman Road between the new structure and I-90. Construction to build a new Vrooman Road bridge over the Grand River in Perry and Leroy Townships began September 2018. All through traffic should follow the posted detour of I-90 to SR 44 to SR 84. The entire project expected completion date is Fall 2020. On Thursday, November 1, 2018, the intersection of Seeley Road and Vrooman Road will close for the duration of the project to accommodate the construction zone. 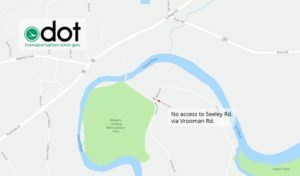 Seeley Road will remain accessible via Paine Road, maintaining access to Indian Point Park. Access will be maintained for emergency and Lake Metroparks vehicles. For updates on the ongoing Vrooman Road Bridge Project, visit ODOT. For questions or concerns, contact [email protected].